When a deadly virus races through Germany, a new breed of demons are born called the Demoniacs who have the ability to meld technology with their unholy powers. This leaves mankind in a serious deadly predicament and a military group called the XAT (Xenogensis Assault Team) have been called to action to contain these outbreaks of demons. The XAT are a highly trained military group who ride bikes and contain state of the art equipment, more specifically... weapons of mass destruction. With a variety of characters joining the mix, it's interesting to become involved in each of their motivations and journeys as they attempt to rid the planet of the Demoniacs before it is too late. My favourite character in Blassreiter (translation Pale Rider) is Gerd, a former professional motorcycle racer who unfortunately had his legs crushed during a Demoniac attack. However his life soon finds new meaning when a strange woman offers him a cure and before long, he has the ability to walk again, thanks to his new Demoniac abilities. As the series progresses, we soon learn that the strange woman who healed Gerd called Beatrice is not as honest as we first thought she was and this is where the series kicks into high bear with its intrigue and mystery. With the world split against Gerd, some believe that he is their saviour and others their doom, an intricate story begins to unfold that is filled with action, drama and a story that would make some Hollywood directors blush. Another interesting aspect of Blassreiter is that the series does not really revolve around just one character, although Gerd is a constant, there are other characters that are just as equally interesting and important to the story. The bad news is that we now have to wait for part 2 to be releases! The video supports an aspect ratio of 1.78:1 and the animation, a mixture of CGI and traditional animation boasts vivid colours, deep black levels and we only noticed a little grain throughout the entire viewing. The contrast between both worlds, that of the humans and the demons is quite visual and does enhance the story. The audio is presented in Dolby Digital 5.1 that makes good use of all the channels when used through surround sound. 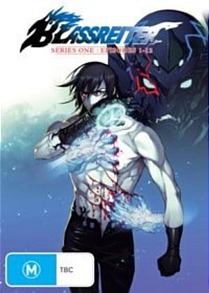 Blassreiter may be travelling down that familiar anime path again with demons, and cybertech but unlike the majority of duplications in this genre, there is something uniquely interesting about this series. Perhaps because it was set in Germany or because of the in-depth nature of the characters, Blassreiter worked and this was a damn enjoyable watch!